In the early 1900s, black families owned and rented homes on the south side of this block, while white families owned and rented on the north side. The neighborhood known as Steptoe, now nearly gone, set aside land where former slaves could buy homes. Steptoe flourished in the early part of the century. It was unusual for black and white families to live on the same block as Midtown Kansas City developed, but that’s just what happened on a few Plaza Westport neighborhood blocks. For example, the block from W. 43rd to W. 43rd Street Terrace (or Steptoe Street) had almost two dozen homes in 1940; about half were occupied by black families, while half were home to whites. The block was part of an area known as Steptoe, a section of Westport later incorporated into Kansas City. Much of the block, including the homes that stood on Steptoe Street, are gone today. But a look back at census records and historic photos shows a thriving, mixed-race block in the early 1900s. A handful of families moved into newly-built homes around 1910, and were joined by others until the block was filled out in 1920 and 1930. During that period, white families moved into homes they owned and rented along 43rd Street. Black families owned and rented on the south side of the block, along Steptoe Street. 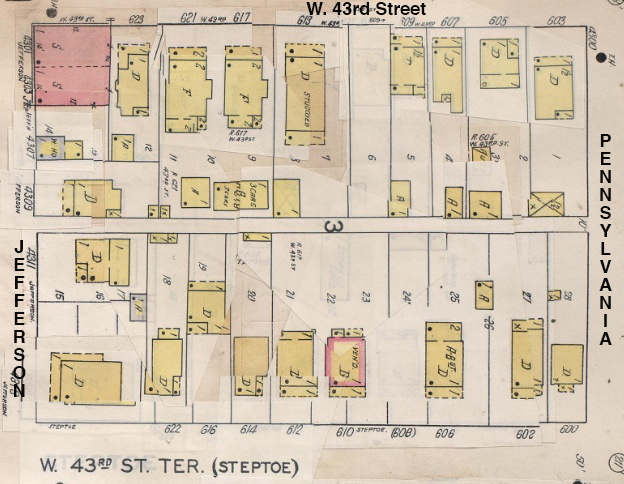 The highlighted area shows the block today, with a few houses still standing on 43rd Street, but the Steptoe (or W. 43rd Street Terrace) homes mostly gone. As part of our Uncovering History Project, the Midtown KC Post is taking a look at each block in Midtown, including a set of 1940 tax assessment photos which is available for many blocks. (Many people seem confused by the tax assessment photos, which all include a man holding a sign. Here’s the story behind them). Today, the block bounded by 43rd Street and 43rd Street Terrace (Steptoe), between Jefferson and Pennsylvania. A 1907 map from Tuttle and Pike’s Atlas shows Pate’s Addition, the area that became known as Steptoe. The highlighted area is the block being focused on today. The other remarkable fact, Maddox wrote, was that the founding fathers of Westport set aside land for former slaves. After the Civil War, the Steptoe area grew as new families moved in. A school in Steptoe served the area’s black children, and two churches served the black neighborhood’s spiritual needs. This block was primarily residential, with only one business building. That storefront, at the corner of W. 43rd and Jefferson, was used as a grocery store from at least 1910 to 1943. It was known as the Corbin Park Market and later as the Kyte Grocery Store. There was an apartment above the shop. One of the earliest mentions of this block of Steptoe Street is a 1910 classified newspaper ad, offering a “Cottage for Colored People.” It referred to the home at 620 Steptoe, a four-room building on a 37 ½ foot lot. More homes were built and families of both races moved in during the 1920s, with only white families living on 43rd and Jefferson Streets, while black families filled the homes on Steptoe. 622 Steptoe: Silas S. Birch, an apartment janitor, and his daughter, Diantha D. Lewis, a cook and later a housekeeper for a private family, rented here in both 1930 and 1940. 614 Steptoe: In 1920, Randall Lillard, a church janitor, owned this home with his wife Coral, a laundress, two daughters and a son. They all gave their race as mulatto. In 1930, Frank Tally, a cook for a private family, rented here with his wife Marquista, a son and a daughter. They had been replaced in 1940 by Spencer Marks, a retail bakery barn porter, with wife Bertha. 612 Steptoe: In 1920, B.J. Givens, a general laborer, lived here with his wife Carrie, listed as mulatto. Ten years later, the Givens family still owned the home. Carrie was working as a cook for a private family. The 1940 census found James P. Duckworth, an elevator operator in a meat packing company, owning the home with his wife Willie and sister-in-law Ellen Stapler, a maid in a private family home. 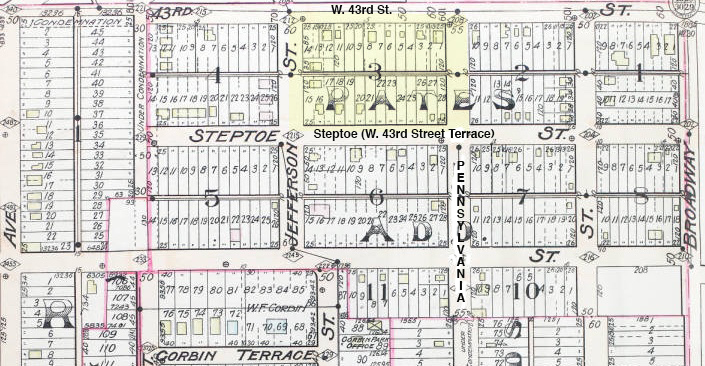 The block in a 1909-1950 Sanborn map. 610 Steptoe: Ownership changed over the decades, beginning with Anna Williams, 42, housekeeper for a private family, and her widowed mother Mary Littleton, in 1920. In 1930, Henry Elliott, a post office janitor, and his wife Anna, owned the home. The 1940 records shows Isaac Davis, a federal postal building janitor, his wife Lillian, a laundry press operator, a son and a niece. 606 Steptoe: A 1920 classified advertised 606 and 608 Steptoe for sale: “Modern; 4 rooms; bath, water, gas; polished oak floors, up-to-date; can sell to colored.” In 1920 Winston Dillard, a janitor, 40, and his wife Cora, 39, three daughters and two sons, all listed as mulatto, owned the home. The house was sold again in the 1930 and in 1940, became home to Lloyd Givens, a business building janitor, his wife Harriett and a 23-year-old son named Horace, an apartment building elevator operator. 604 Steptoe: In 1930, John S. Harris, an automobile club cook, owned this building. 602 Steptoe: The Walter Hatch family owned this home from 1920 through 1940. Hatch was a porter for the Pullman Company and later a janitor at a municipal building. His wife, Emma, sometimes worked as a dressmaker. 600 Steptoe: On the corner of Pennsylvania and W. 43rd Terrace, Frank Locke, a hood carrier, lived with his wife Lizzie, a laundress and a son, in 1910. By 1920, the Herndon Williams family had bought the home; he worked at Armour and Company, supporting wife Alberta and two young children. Perry West, a construction laborer, his wife Sallie, a laundress, and an 18-year-old daughter Inez, who worked as a maid to a private family, were here in 1930. 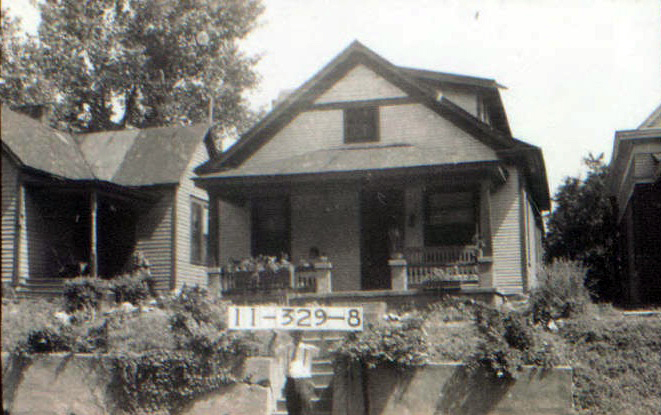 The slideshow below shows the rest of the homes owned by black families in 1940. 603 W. 43rd: Jess W. Sutton, a railroad porter, rented here with his wife Rilda and a daughter in 1930. George Hatch, a wholesale petroleum salesman, and his wife Tacie Marie, took over the rental in 1930. 605 W. 43rd: From at least 1930 to 1940, Frank McClelland, a telephone company foreman, owned this home with his wife Rose. 607 W. 43rd: James Callison, a federal postal clerk, and his wife Beulah, owned this home from 1930 to 1940. 609 W. 43rd:Frank L. Towsley, a railroad tracing clerk, and his wife Ninette lived here in 1930. The 1940 residents were Frank Turner, a wholesale electric telephone repairman, his wife, Irene, a daughter and a son. 611 W. 43rd: In 1920, Joseph A. Rogers, a house carpenter, rented here with his wife Tallie, 27, and two daughters. The home was vacant on census day in 1930, but 1940 found Henry Porter, a retail coal yardman, with his wife Rose, who worked in an automobile map factory, living here with son Louis Porter, a gas station attendant, and daughter-in-law Elaine, a life insurance company bookkeeper. 613 W. 43rd: In 1930, Charles M, Pierce and his wife Dora, a practical nurse, shared the home they owned with three boarders: Mary Childs, a department store saleswoman; Erick H. Brento, a steel mill traffic manager; and Lillian Brento, a hospital nurse. 617 W. 43rd: In 1930, this house was owned by Hans Datschewski, a barber, and his wife Elise; in 1940, Susie Worth, a single woman, owned it. 4309 Jefferson: In 1920, Linn B. Powell, 32, a Metropolitan Street Railway street foreman, his wife Mildred, and a son and a daughter ages 4 and 6 rented this home. A decade later, the occupants were Joseph Littleton, a meat packing company cashier, and his wife Faye. By 1940, Roy Lyons, a taxicab chauffuer, with his wife Evelyn, and a male lodger, William Zregler, an oil and gas salesman, had moved in. 4311 Jefferson: Jacob Bucher, 54, a city street department watchman, lived here in 1920 with his wife Nora, 48; son-in-law Eugene B. Bunerite, 23, an order clerk at Swift and Company, his wife Hazel and two young sons. From 1930 until later than 1940, the Frank Galbraith family owned the home. Following Frank’s death, his widow Kate lived here with daughter Nan Yonker and two granddaughters. 4313 Jefferson: Samuel McCollum, 43, a gardener, his wife Lillian, 29, and two sons lived here in 1920. In 1930 it was Charley Crabb, a gas distribution company laborer, with his wife Lela, a daughter, granddaughter and grandson. These photos show the rest of the homes of the block, all owned by white families in 1940. I believe the storefront shown in this article was later Temple Slug, where I bought my first waterbed. This is an excellent article about Steptoe. I grew up in Steptoe. I lived at 410 West 43rd Terrace. I would love to get information on that block. I attended St James Missionary Baptist Church . I attended Penn School, Allen School and Graduated from Westport High School in 1964. My family name is Avery. The granddaughter of Floyd and Essie Avery. This article brought back so many fond memories if my beloved neighborhood.